Helping other people succeed is something that Sanjidha Ganeshan, a second year psychology student from Quatre-Bornes, Mauritius, has always wanted to do. Now she is very much looking forward to working to help other international students adjust and thrive to life in Canada and at StFX. 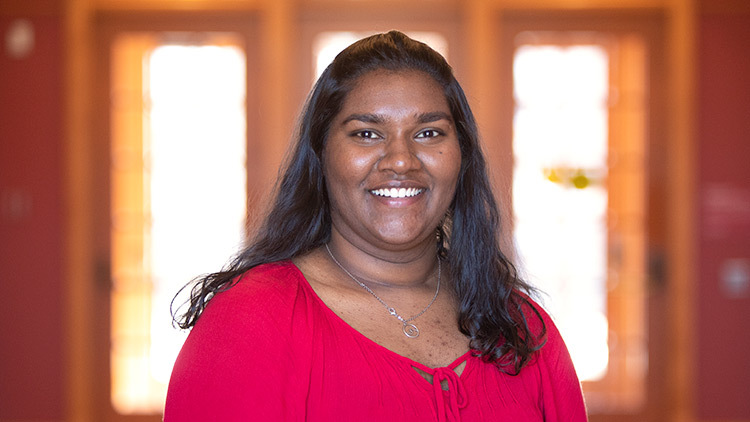 Ms. Ganeshan has stepped into two leadership positions at StFX. She has been elected as both the international students’ representative on the StFX Students’ Union and as the president of the International Student Society at StFX. “I want what’s best for people. Thinking about my first year at StFX, and how the International Student Society and the International Office was always there to help, to offer advice, I want to be that person who is ready to help students, and that’s why I wanted to take the leadership position,” she says. Ms. Ganeshan says as a high school student she wanted to study abroad, but she wasn’t sure where she wanted to study. She first learned about StFX while attending an education fair in her home country where StFX representatives were on hand to talk about the university, the town, the benefits of attending, and the door that would open on new opportunities. She decided to apply. Ms. Ganeshan, who speaks French and Creole, learned English in school and could speak the language, but says she found it hard at first to converse and study in English all the time. Coming to a new country can have its challenges, but she says one of the benefits has been learning to step out of her comfort zone, including being the one to stop being shy and starting the conversation with others. She currently serves as the secretary of the International Student Society, and she says that helped her a lot. “I get to meet a lot of people, and help them with the transition to Canada and to adapt to university life. Ms. Ganeshan says she has found her courses at StFX very interesting, but also a lot of work. She’s enjoyed the fact that the smaller campus has made it easier to meet people and that smaller classrooms make it easier for professors to know their students. She says the friendly environment and community stands out for her about StFX. As for what she’d tell other international students? “It’s hard to leave your country and come to a whole new place that you’ve never heard of before, especially if English is not your first language. It’s going to be hard, but you will be able to get through it. StFX is an opening to new opportunities, and there will be someone here to guide you. It is definitely going to be a challenge, but you will be able to overcome obstacles and fears and, in the end, you'll be proud of your success and what you have been able to achieve."